Our more interesting trip is on hold, as rain has set in over the north east of NSW, apparently for a week. We know why it is called the rainforest region. It’s still mild, although not as warm as it was when we arrived. Russ has erected a tarp over the washing, (he feels like he is really camping now), but with the high level of humidity, it will be a while before we are folding! Filling in the time hasn’t been difficult. Yesterday we had the washing and chores to do, so popped up to the pub for a delicious meal at lunchtime. Macadamia coated Dory strips with chilli/lime aioli. Today we headed off in the wet to picnic at Minyon Grass picnic area, planning to walk to view the Minyon Falls, but fog put a dampener on our intentions. We still BBQ’d (chicken teriyaki skewers, with coleslaw). 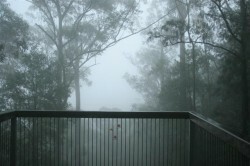 The magno men were climbing the walls with impatience, waiting for the fog to lift. Unfortunately they were disappointed and they became more angry, because we have to return to BALLINA. Yes, the van has been leaking from a window and the sky light, so we have to stay here until Wednesday. Here we go again! Adam, the Service Manager at Kimberly said as we left last time that “I’ll wait to hear from you again” and unfortunately, he was right!!!! Sitting in the sun with no rain here, sorry to hear about the van, comments made about knowing the service managers name and what he thinks when he sees you coming. Something to make Marg jealous, Pete and I,(Pete)have been fishing up the Pambula river and have so far got six salmon the largest we think at least six pounds, so we are eating well, it helps to have the inflatable boat!! Lucky devils – all I could manage were 4 tiddlers, but I enjoyed trying!! See you all soon!